No, no, no. I don’t mean “lost” salvifically. 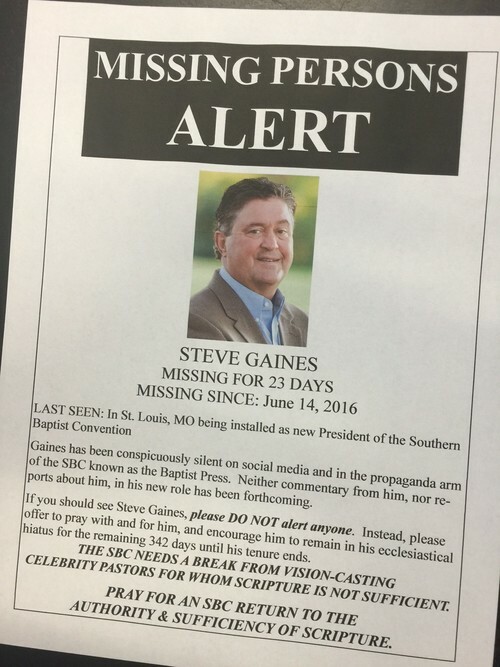 I mean lost as in, “where’s he been?” It’s been 23 days since Bellevue Baptist pastor Steve Gaines ascended to the hierarchy of the largest Protestant denomination in the country. For the bulk of those days, he’s been noticeably absent from social media, the Christian news world, and even within the Baptist Press. Gaines hasn’t weekly issued Floyd-esque entreaties for a great awakening. It’s been over three weeks since a top-down apology for the atrocity of 19-century slavery has been proclaimed. He’s not penned pithy commands invoking unity. Barring a few random retweets, and one notable comment, Gaines has been M-I-A. Gaines’ blogsite, SteveGaines.org, lists 4 (FOUR) posts. The most recent one is dated May 23, as he was campaigning for the SBC throne. That entry includes links to 4 video blogs on topics including spiritual awakening, soul-winning, and stewardship. On July 2, Gaines did briefly emerge from his presidential silence to comment on an article from the Christian Post. 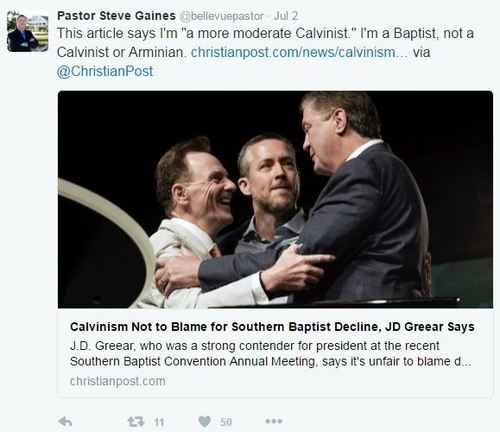 That article, Calvinism Not To Blame For Southern Baptist Decline, JD Greear Says, was the result of an interview with Greear in which the cause(s) for the continued staggering decline of SBC membership was considered. However, it was a single comment in that article, about Gaines, which drew him out of apparent hiding to offer a “correction” on Twitter. “This article says I’m ‘a more moderate Calvinist.’ I’m a Baptist, not a Calvinist or Arminian.” Hmm. Really? That prompted Gaines to gently rebuke the Christian Post? And what does he even mean by “I’m a Baptist?” Exactly what theology does he think is “Baptist?’ The history of “Baptist” is replete with a foundation based on apostolic teaching and the witness to Truth given by our Lord. Throughout two millennia, and especially subsequent to the Reformation, that “Baptist” theology has been richly infused with, and substantially based upon, Reformed theology. Even a superficial reading of Baptist history reflects this. It’s unclear what exactly is meant by “I’m a Baptist.” Since Calvinism and Arminianism represent theological systems, Gaines presumably means to imply “Baptist” is a theology. What’s he mean by that? Does he align theologically, say, with someone like Charles Spurgeon, whom he quoted in another tweet also issued on July 2? If Gaines aligns with Spurgeon, another man who would proudly join him in asserting “I’m a Baptist,” that’s great news. Because it would help us identify Gaines’ theology within a more tightened, specific framework. Spurgeon was a Baptist and a Calvinist. Gaines, though, says “I’m a Baptist, not a Calvinist or an Arminian.” Well, on a very fundamental level, the simplest explanation of these two systems of theology rests on whether one believes Scripture teaches “salvation belongs to the Lord” (Psalm 3:8) or whether man, “dead in trespasses and sins,” (Ephesians 2:1) can revive himself just enough from that spiritual death to reach out and take the life buoy of salvation being extended by Christ. As it stands, if Gaines isn’t a Calvinist or an Arminian, that leaves him as just another vision-casting, mega-church, doctrine-free, word-of-faith (see the @bellevuepastor tweet below),celebrity pastor whose singular goal is to pump up the baptism rolls, load the pews with goats, and sell a Gospel that would be foreign to any 1st-century apostle time-machined to Memphis today. Southern Baptists would be well-served if Gaines would remain in the background, cease with the vision-casting, stop the unbiblical preaching on such things as tithing, refrain from allowing cult members to occupy his pulpit, and repent from his “name it – claim it” propensities. He needs the time off, hopefully, to study what Scripture actually teaches. Who knows? He might just discover – as so many of us have – that theology matters …eternally. And if you don’t know yours, exactly what are you doing in that pulpit anyway? Pray for the SBC, folks. We need a return to Scripture. We need to trust in its authority and its sufficiency. We need to obey it … and that ain’t merely “a Baptist” thing. Take The Lifeway Quiz! Match The Plot To The Cover, Amish Christian Romance Style!